A Genentech sign is pictured. Genentech Inc., AmerisourceBergen Corp., and other major pharmaceutical companies are experimenting with using blockchains to crack down on counterfeit drugs and meet new requirements aimed at keeping them out of the supply chain. Companies in drug supply chains could use the digital ledger technology to see and verify each product’s movement on an unchangeable, or immutable, record. Such blockchains would show each time a drug changed hands, and help companies detect tainted products before they reach the consumer, attorneys and industry leaders say. The FDA also has launched a pilot program encouraging companies to explore new technologies, including blockchain, to meet requirements taking effect in November. But such efforts to squelch potentially life-threatening fake drugs could hit roadblocks if the pharmaceutical industry isn’t entirely on board. Wholesale distributors are looking to the technology to meet new rules under the Drug Supply Chain Security Act (DSCSA), under which they will have to verify serial numbers on returned drugs before reselling them. U.S. wholesale distributors receive about 58.7 million units of saleable drug returns annually, according to a report by the Healthcare Distribution Alliance, a pharmaceutical distributor trade group. Distributors may have to make at least 225,000 verification requests to manufacturers per day under the requirements taking effect in November, according to the report. A blockchain-based system in which distributors scan product serial numbers to request and receive manufacturers’ validation could help ensure compliance with the law, Heather Zenk, AmerisourceBergen’s vice president of global secure supply chain operations, said. But getting manufacturers and other trading partners on a blockchain could prove tricky as companies weigh potential privacy risks and the costs of switching to the technology. Interoperability challenges could also hinder the effectiveness of such blockchains if companies are using different systems. But to be effective, the whole supply chain must take part in the system. If data points are missing in a product’s journey through the supply chain, companies can’t vouch for what happened during that period, Andrew Hill, an attorney in Frost Brown Todd LLC’s blockchain and digital currency practice group, said. A big concern is “just getting everyone in the supply chain to buy in to the process,” he said. Some companies, however, may not want to adopt the technology when they already have a system for verifying drugs. Businesses also have to weigh potential privacy risks of putting their data on the blockchain, given that data can’t be removed once its entered, Robert Musiala, blockchain counsel at BakerHostetler in Chicago, said. Companies are piloting closed, permission-based blockchain systems, but they will still have to ensure their data doesn’t end up in the wrong hands, he said. Companies may be hesitant to enter their data on the blockchain, knowing the difficulty of removing that data if they decide to leave at a later date, Musiala said. “Companies will want to iron that out beforehand so it doesn’t turn into a contract dispute that derails the effectiveness of the blockchain solution,” he said. Industry players will have to devise rules governing blockchain data sets to ensure there is a minimum level of security and that proprietary data is kept secure, Zenk said. Drug companies are eyeing blockchain use to meet new rules in the DSCSA, a 2013 law that lays out steps for building an electronic system to trace prescription drugs. The law rolls out requirements over a 10-year span. San Francisco-based software company Chronicled Inc. launched the Mediledger Project in 2017 to explore how blockchain use could help meet the 2019 wholesale distributor requirements. The company is working with Genentech, AmerisourceBergen, and others on a messaging network in which a distributor scans a product for verification, and a look-up directory on the blockchain routes that request to the manufacturers’ private node. The private node stores the product’s serial number and matches it with the scanned number. Germany-based SAP SE created a blockchain network that lets users verify drug product serial numbers by matching them with stored manufacturers’ data. SAP developed its network with AmerisourceBergen, GlaxoSmithKline plc and other companies. 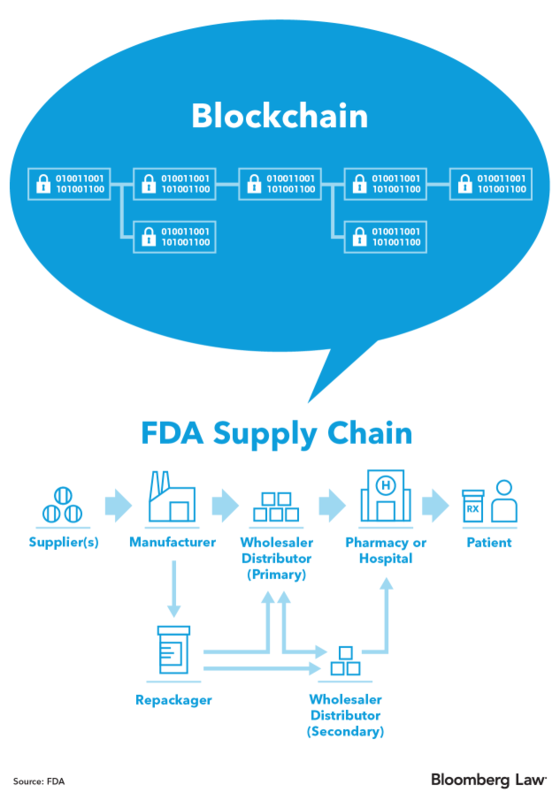 The FDA is also exploring how blockchains can improve traceability and fight fake drugs. The agency in February launched its pilot program calling on companies to design innovative approaches—potentially including blockchains—for tracking and verifying prescription drugs. Wholesalers will have to ensure the brands they distribute join the blockchain or can send data to it, Zenk said. If manufacturers are on different blockchain platforms, the platforms will need to be able to communicate with each other, she said. Interoperability is a complication that companies will have to work through, Musiala said. For example, some entities in a pharmaceutical supply chain may be on blockchains designed for other industries, such as the shipping industry, he said. Some companies are stepping forward to help bridge the gap. SAP’s blockchain solution can route verification requests to non-blockchain based directories, said Oliver Nuernberg, chief product owner of SAP for Life Sciences. If a company in the supply chain isn’t on a blockchain, other participants can still access its data and verify a drug transaction, he said. U.K.-based FarmaTrust, which also offers blockchain-based drug tracking services, says its product can operate with other systems. Some companies still don’t understand how blockchains work, Hill said. “Basic informational barriers need to be met” to get companies on board with the idea, he said.